This website is created solely for non-commercial purposes. As its title suggests, it is an unofficial website, with no connections to the family of Gerda Nicolson. If you have any questions, comments or contributions regarding the site, please follow this link. My name is Daniel, I am 28 years old and I come from the south of Sweden, where I have a flat in a medium sized town called Ronneby. During the weeks I study history and English at a local university. The aim with my studies is to become a teacher with a Master's degree in above mentioned subjects. I have been studying for some years now, but I am not finished altogether until two-and-a-half years from now. Another interest of mine is playing theatre, which I have been doing, on and off, since I was seventeen. The latest production in which I appeared was a local review during the spring of 2005. I have through the years been acting in all sorts of plays, ranging from Strindberg and Lorca to more modest comedies. Why does a man in his best years produce a site about a fairly unknown actress from an obscure continent on the other side of the globe? I have been forced to answer this question many times, so I am well-prepared. Actually, the reasons are not as strange as some would think. First of all, I am a person that wants to see things complete. I was surprised that Gerda did not already have a website dedicated to her, and that there were so little information on her on the Internet and elsewhere. I quickly decided to do something about this -and here we are. Before, there were information only here and there, scattered all over the Internet. I wanted to gather all information in one place, and hopefully add some new details that had not been seen before. It was the same when I could not find a good website on ocean liners some years ago - I now own the probably most comprehensive site on the subject that can be found on the web. Visit that site here. I started watching Prisoner on Swedish television in about 2000 or 2001, I believe. As a student, sometimes you do not have to go up early in the morning, so the fact that Prisoner was aired in the middle of the night was not a problem. At first, my favourite became Bea Smith, and when she left the series I never thought it would fully recover. Some might argue I was right, but by the time Bea was gone, another character had entered Prisoner that triggered my interest. She was, of course, Ann Reynolds. As mentioned above, my interests lie within history and English, and Gerda embodied both those interests. She (at least the character Ann Reynolds) was of the old school, knowing that everything and everyone has its place. She represented the successful elite in society that everyone respect. Added to this, she had a great amount of humility in her heart, and this did not harm the authority she showed. A popular view is that the state is an evil beast that only want to hurt the 'little man'. Ann Reynolds proved that it is not so - she represents the true side of the state that cares and is just. The state with all its ministers - and prison governors - is there to help you. My English interest was soothed by Gerda's beautiful British accent. I have myself always talked with a British accent, and to see such a loved and respected character have that accent, certainly pulled a few strings. Her authority was even further established by the amazing power hairdo. High and extremely retro, it reminded of an eighteenth century powdered wig. This sort of hair is very rarely seen today, even though Prisoner was produced only twenty years ago. Added to all this, Gerda was a very beautiful woman. Also, the fact that she is no longer with us has made her into sort of a martyr for me - my version of Last of the Mohicans becomes 'Last of the Retro Women'. I have never met anyone like her. However, as I know fairly little about Gerda's personal views and personality, I tend to mix her up with character Ann Reynolds. But, as she got role after role as the same type of character, Gerda probably had some similarities with this kind of person. 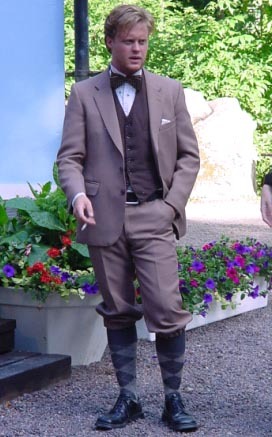 Me during a break when acting in the stage play Hjälten från Ekenäs (Der kühne Schwimmer) by popular German playwriters Franz Arnold and Ernst Bach.